Topics: Benefits, Partnering, and Demo. Age: It went live on August 28th 2000, making it over 17 years, 7 months old. 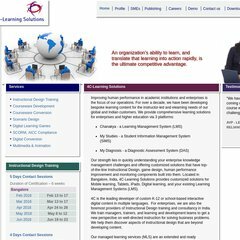 4c-learning.com Instructional Design Training India, ID training, from 4C, an ..
4c-learning.com SCORM AICC compliance, non SCORM course to SCORM, e-Learning ..
4c-learning.com EDUCATIONAL TECHNOLOGY, INSTRUCTIONAL DESIGN, TEACHER TRAINING ..
4c-learning.com eLearning, make buy outsource, help in decision, avoiding failures .. It is hosted by Theplanet.com Internet Services Inc (Texas, Houston,) using Apache web server. There are 3 Nameservers, ns1.interactivedns.com, ns2.interactivedns.com, and ns.interactivedns.com. Its IP Number is 184.173.121.30. PING (184.173.121.30) 56(84) bytes of data.